A forestry business owner and his dog-walking daughter have won their battle with council planners to build a bespoke dog day-care centre and several workshops. Wilson Jamieson, of Barr Road, Galashiels, applied to Scottish Borders Council for permission to build seven workshop units and a two-storey dog day centre at a depot on Langshaw Road, but the plans were rejected by planning officers. The Farknowes depot is owned by Mr Jamieson’s company, Wilson G. Jamieson Forestry and Fencing, and his daughter Leonie Jamieson runs Galashiels Dog Walking Service. The plans will see Ms Jamieson set up a permanent headquarters for her business, including office space and an exercise paddock for dogs, but council planners said the Jamiesons have not shown there is sufficient economic need for a development in the countryside and that the aesthetics of the proposals would not be in keeping with a rural setting. Following an appeal, the case was referred up to the council’s local review body for reconsideration, which met on Monday, March 18 to deliberate on the plans. A statement, presented to councillors on behalf of the duo by Peter MacLeod, of Gain Planning Services, reads: “The proposed workshops would provide a valuable resource to local small businesses at an affordable price. The demand for such a use has been demonstrated by the fact that most of the units have already been requested in advance of development. 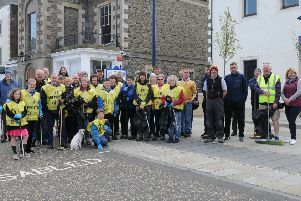 Jedburgh and District councillor Scott Hamilton commented: “I think there is a need for a business such as this to be located here. Councillors voted to overturn the decision of officers, and granted approval for the application. However, councillors have also agreed to several conditions for the development, including demanding the developers submit a parking plan, a dog care management plan and a waste storage management plan. Furthermore, councillors have asked for fencing to be placed around the property to prevent dogs from escaping. Council officers also confirmed that if Ms Jamieson wishes to board dogs on the property overnight, then she will require a seperate licence from Scottish Borders Council.